Of course the heart of any aerator has got to be the compressor, linear air-pump, regenerative blower or windmill bellows but let's not forget to look at the myriad array of diffusers. The diffuser is what breaks up the airflow into bubbles! Big bubbles, small bubbles and even micro-bubbles or ultra fine bubbles all can be used to achieve different results. Just like a home stereo system can sound great through a set of high quality speakers even if the turntable is marginal; so too can a proper diffuser make an old homemade air pump actually create some decent aeration! Many aeration supply firms and pond stores sell cheap diffuses and some of these are just that: cheap! Maybe they'll last a year or maybe two, but as with any part of the aeration system, whether it is changing the worn out pistons on a Gast compressor or replacing the worn carbon vanes of a Brookwood compressor, a diffuser may need periodic cleaning with muriatic acid. A good diffuser assembly can be a weighted disc system like the Vertex CoActive Air Station with 2 nine inch diffuser discs on a hollow base that can be filled with rocks to keep it on the bottom or a Koenders Airstone which is simply placed in to a bucket with some stones and lowered in to the pond. You want to build a home made diffuser? No you don't...you only think you do! The idea of scrounging through the tool shed for some pits of PVC pipe or hose and some metal jugs or gathering buckets and attempting to fasten a sealed skin from some recycled EPDM membrane might sound like a good idea but it isn't. Sure you can take some SCH 40 pipe and drill some holes in it and cap of the end and epoxy glue a 3/4" NPT air supply connector and make some contraption that will release bubbles but that doesn't mean you will have an efficient diffuser. The best diffuser is one that uses the available airflow and horsepower to maximum efficiency but breaking up the air into bubbles...but not all Bubbles are created equal. I know...it sounds discriminatory but it's the Truth! In most cases you want to have small bubbles and the smaller the better. Ultra-fine bubbles or micro-bubbles as they are sometimes called in the industry are what creates the most efficient aeration. Normal airflow range is 0–5 cfm. Equipped with 3/4" MNPT. Single disc or multiple discs can be used with linear air pumps, piston pumps, rotary vane pumps or regenerative blowers. These airstones are highest-quality ceramic-type air diffusers machined from a solid block of glass-bonded silica. Because dust and dirt particles up to 30 microns in size will pass right through these diffusers, there's no need for expensive air filters. These self-weighted synergistic diffuser assemblies have some of the smallest and finest bubbles available in any diffuser . Much of the actual oxygen transfer in to your pond or lake actually occurs at the atmosphere/water interface where water is introduced to the atmosphere by being pushed towards the surface by the rising bloom of bubbles. As the water breaks the surface tension of the pond or lake the oxygen transfer occurs and the water, now with higher levels of vital oxygen, descends back in to the depths where it causes dissolved O2 levels to be higher and higher depending on temperature and barometric pressure among other variables. But that doesn't mean you can just drop an open ended length poly irrigation pipe running in to the pond from the end of a tire pump and expect these basketball sized bubbles to create enough lift to properly aerate...no...it's not that simple because the bubble size also plays an important role in the Gallons Per Minute lifted towards the surface and the important oxygen transfer that occurs between the thin walls of the bubbles themselves as they stream upwards from the diffuser towards the surface. Yes it is a multifaceted process and while it may be sounding too complex there is a simple rule that applies to most pond diffusers..
Let's have a brief lesson in fine bubbles, it will be fun (well...not exactly) and you will get a short course in why smaller is sometimes better especially when it comes to diffuser bubbles. Let's take a fairly large bubble as far as aeration goes. Our large galloping bubble that is 0.8" in diameter, just over 3/4 of an inch, or 20 mm has a full volume of 1.64 cubic inches or 4.19 cubic centimeters. This same glorious orb has a surface area of 5 inches or 12.6 square centimeters and that is what we can define as a coarse bubble! Now a coarse diffuser like an airstone would create large bubbles like in lesson one but if we could use the same volume of air but break that large sphere into smaller ones we could greatly increase the available surface area which in turn enhances and embellishes the aeration transfer capacity of the same air volume! If we replaced that one large 3/4" wide bubble with tiny bubbles or micro-bubbles that were 1/16 of an inch or 3 mm in diameter we could fit 296 of these fine bubbles into the larger one of lesson 1! The combined surface area of those 296 bubbles works out to over 33 square inches or 84 square centimeters! This is close to 7 times the total surface area...and the surface is where the oxygen transfer occurs. Now since the surface area is close to 7 times greater we can theoretically aerate 7 times as much water with the same compressor or blower or air pump depending on whether we have a fine bubble diffuser or a coarse bubbler. Same air pump, totally different efficiency!! Normal airflow range is 0–5 cfm. Equipped with 3/4" MNPT. 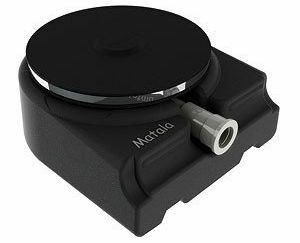 Single disc or multiple discs can be used with linear air pumps, piston pumps, rotary vane pumps or regenerative blowers. Ideal for everything from small ponds to large lakes. Practically invisible due to their dark color, these 9 inch membrane discs are engineered for extended performance. 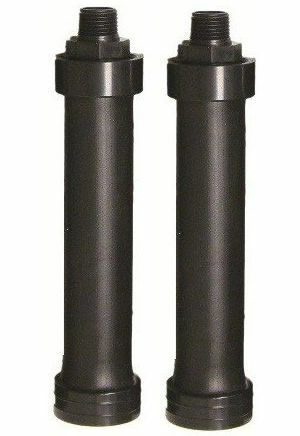 The actual disc diffuser bodies are made of high-strength polypropylene with 3/4" MNPT connections to attach to airlines, manifolds or headers. Each diffuser has an average of 6,600 engineered air release orifices, 20% more than some comparable models. The special design of the mat, flexible and supple EPDM membrane, with its proprietary thickness taper, results in full utilization of the membrane surface, even at low airflow operations. This results in improved oxygen transfer efficiency, along with maximum operational flexibility. The disc diffuser has an integral "triple" check valve to prevent fluid backflow. Resistance is about 10" H2O when clean. Made in USA. Note: Diffusers are also known as airstones, these are membrane diffusers with an EPDM fine bubble perforated system. These are highest-quality ceramic-type air diffusers machined from a solid block of glass-bonded silica. Because dust and dirt particles up to 30 microns in size will pass right through these diffusers, there's no need for expensive air filters. And with an air resistance of less than .25 PSI, these glass-bonded diffusers are compatible with economical low-pressure blowers. They produce a uniform medium/fine bubble and are very resistant to clogging. And when cleaning does become necessary because of a buildup of calcium precipitate or bacteria, an acid bath restores them to like-new performance. Made in USA. With their round grain pore structure, low resistance to airflow, uniform porosity and resistance to clogging, these airstone diffusers are clearly the best diffusers available for general aquaculture aeration. Smaller pores don't necessarily produce smaller bubbles. These diffusers are engineered to produce the smallest bubble possible within the constraints of a reasonable service life. In most soft water applications, they won't need to be cleaned for more than a year. Note that water pH in excess of 9.0 will shorten the diffuser life. Self-weighting when used with typical tubing lengths. No need to add sand or rocks in to a hollow base like so many diffusers! These diffusers assemblies need no extra weights! Normal airflow range is 1.5 - 2.4 CFM. Equipped with 5/8" barbed connector. These weighted diffusers lay flat upon the lake or pond bottom so disturbed sediments is minimized and airstones do not become fouled or covered in muck due to the underlay which keeps the airstones out of the sediment. They are also the best choice for deep ponds and lakes and for storm water retention ponds and commercial and industrial aeration. Can also be used with rotary vane compressors, rotary screw pumps and high pressure blowers or piston compressors for a simple and easy aeration system. The flat base has holes for attaching mooring ropes if you wish to add a float to the diffuser for future retrieval or removal or replacing of the diffuser. You can also tie a float a few inches below the surface so you don't have to see the float. The dark color of the sediment-preventing base ensure the diffuser assembly remains invisible. Some of the smallest and finest bubbles available in any diffuser means that you get the most lifting of water column towards the surface and less pressure loss during operation. These diffuser assemblies require less PSI and so are perfect for linear air pumps in most ponds! Can also be used with rotary vane compressors or piston compressors for a simple and easy aeration system. Contact us if you have questions or unsure how many to add to your pond. See other diffusers for small ponds or wastewater. . The Lake and Pond Management Guidebook is the successor to the bestselling Lake Smarts: The First Lake Maintenance Handbook, the "bible" for small-scale lake and pond improvements, published by the Terrene Institute in 1993. Completely revised and updated, now published by Lewis Publishers, this guidebook contains over 300 ideas and projects including step-by-step practical, low-cost solutions to a wide range of problems that lake management professionals face everyday. Coverage includes shoreland buffer installation, fisheries management, reducing nuisance algal growth, controlling exotic aquatic plants, lakeside wastewater treatment systems, small scale dredging, and more. What else can simultaneously increase your aesthetic pleasure, offer recreational opportunities, help the environment, and increase the value of your land? This is the recognized standard on ponds, now expanded to include a comprehensive guide to living happily with your completed pond and keeping it perpetually healthy. Here is everything you need to know about planning, digging, sculpting, and maintaining your pond. The expanded guide to New York State lake and watershed management, 2nd edition. Lake associations and citizens play a vital role in protecting and restoring our lakes and waterways. This book is an introduction to understanding and managing lakes. Lakes and their watersheds are natural treasures for us to use and protect. Together these rich resources supply abundant water to support thriving communities, provide recreational opportunities, and spur economic growth in an area. When comparing aeration systems it is a good idea to look for forums and reviews that discuss the pros and cons of various systems. Since the principals of aeration are scientific and many companies offer products that do basically the same thing to various degrees of efficiency then it is up to us as consumers to use our due-diligence before buying a pond aerator. To compare prices with our recommended systems we have grouped some of the more popular bottom-diffuser aerator brands together for comparison with our best aerator systems. Airflex ® Disc Diffusers and Membrane Diffusers Standard 9" Disc - AF270 Design Flow: 1.5-3.0 SCFM (2.5-5.0 Nm3/hr) Flow Range: 0-7 SCFM (0-12 Nm3/hr) Slit Quantity: 6,600 Standard 12” Disc - AFD350 Design Flow: 2.5-5.0 SCFM (4.2-8.3 Nm3/hr) Flow Range: 0-12 SCFM (0-20 Nm3/hr) Slit Quantity: 10,155 Patent-Pending PTFE Diffusers SSI manufactures disc diffusers with compression molded membranes. Standard materials are EPDM and fluoroelastomer layered EPDM. Compression molding ensures that we produce a part with even specific gravity and uniform tear resistance. Other molding techniques such as injection molding produce similar looking parts, but the tear resistance of a compression molded part is multidirectional, whereas the tear resistance of an injection molded part tends to be unidirectional just like wood which has a grain. There is an art to using just the right amount of plasticizer in an EPDM membrane. Use too much, or the wrong type, and emulsifying fats can leech plasticizer and cause shrinkage and increase hardness. Use too little, and the rubber loses its memory, bubble size increases, and the membrane is at risk for flexure failure. 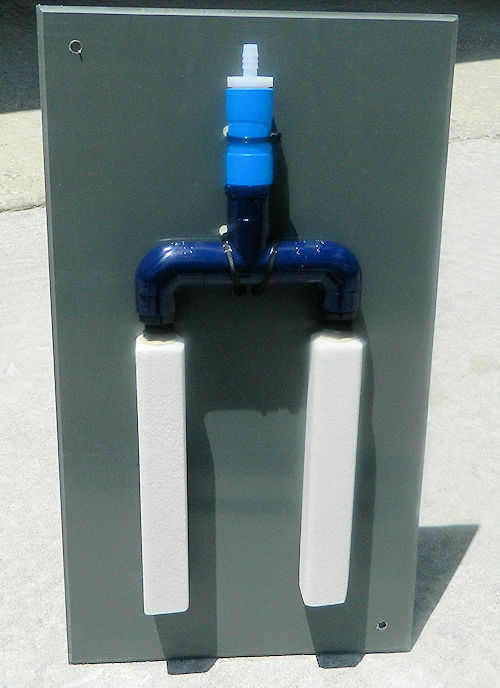 Vertex AirStation CoActive Lift - $145.00 email or phone toll free 1 877-607-5296 Vertex MicronBubble™ technology provides the lake restoration industry's first superfine bubble generation. The majority of bubbles produced by Vertex MicronBubble™ technology are only 500 to 1000 microns in diameter. As bubble size decreases, lifting rates and oxygen transfer rates increase dramatically providing the highest efficiency aerator available today! CoActive dual 9" diameter membrane diffuser discs synergistically create an ultra-wide bubble column for greater upward water column movement without additional airflow requirements. Still only 1.0 CFM required per CoActive AirStation™! Self-cleaning flexible membrane openings prevent diffuser clogging in the dirtiest of lakes. Muddy bottom, dirty, brackish, salt or hard water? No problem! Perfect for retrofitting worn-out, clogged or broken airstone type diffusers. No more airstone acid cleaning or frequent replacement ever needed again! Five-year warranty - all AirStations carry a five-year No Questions free replacement guarantee. Redesigned self-weighted base for easier and faster surface installations. Aluminum Oxide Airstones Unlike the standard silica airstones these airstones can be cleaned time and time again without wearing down. These airstones are actually constructed of the same material used for grinding stones. While increasing durability there has been nothing sacrificed in the quality of aeration delivered to you pond, tank or lagoon. We have also design an airstone specifically designed to work well in an earth pond. These 7" diameter dome airstones have a plate on the bottom to prevent the airstone from digging into the pond and burying themselves in the pond. Use to diffuse the air at the bottom of the water source. Aeration is most effective when air bubbles are very small. Small bubbles increase diffusion of oxygen from the air into the water. Can increase oxygen absorption (your aeration process) efficiency by 800%. Will outlast rubber diffusers. Our Experience: Poor performance, cheap price, you get what you pay for! Entire water column circulation — up to 4000 gallons per minute depending on diffuser depth • Elimination of thermal stratification • Increased dissolved oxygen levels that stimulate the natural aerobic digestion process thus reducing nutrient levels and associated algal growth • Elimination of oxygen related fish kills and expansion of the oxygenated habitat and ecosystem • Reduction of mosquito and aquatic midge infestations • Elimination of foul odors from undesirable dissolved gases • Reduction of organic bottom sediment • Preservation of a healthy aquatic ecosystem and an aesthetically pleasing aquascape to view and enjoy through improved water quality. AquaAirTM provides ponds and lakes with superior aeration, circulation, and de-stratification. The diffusers employ a super fine micro-bubble technology resulting in the highest diffuser oxygen transfer rates (OTR) available today. The micro-bubbles entrain bottom water and synergistically lift it to the surface where atmospheric oxygen is absorbed and then transferred throughout the water column.